It is a typical village that is developing rapidly, and is surrounded by countless coconut trees, benefiting from the deserted beaches that are among the most beautiful in the country. It has a rhythm which is nonchalant and active at the same time. Las Terrenas is situated in the north of the Dominican Republic and is around 60 km from Samana. Numerous beaches, each one more beautiful than the other, are at your disposition. The most difficult thing to do will be to choose your favorite beach. According to all who have stayed in Las Terrenas, there reigns a very particular ambiance. You feel good, and at home. Las Terrenas is totally different from the rest of the country, a seaside resort that is on a more human scale which regroups different nationalities (French, Italian, Swiss, Belgians, Germans, Spanish, English…) all reunited with Spanish as their common language. You can also discover the Los Haitises National Park. It is mainly an ornithological park but you can also find caves that have traces of the original inhabitants: the Tainos. It is also possible to visit various beautiful waterfalls around Las Terrenas, and most notably the one at El Limon, the neighboring village. Each year, the Samana bay welcomes hunchback whales which come here once a year to give birth and mate. It is truly an amazing spectacle and not to be missed if you make the trip in the season. Las Terrenas is a place where you can try different sports: surfing and kite surf can be carried out almost all through the year. There is also the possibiliy of scuba diving. quite a few proffesionals have diving schools where you can rent material or take classes. You can also go snorkling. For the adventure lovers, you can rent ATVs and take an excursion on the coffee and cocoa routes where you will be able to meet the inhabitants of the lomas (hills). 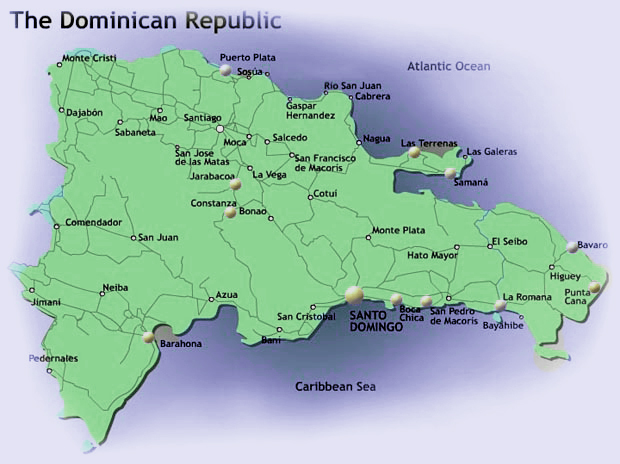 Click Here to see a map of the Dominican Republic. A new intercontinental airport, International airport of El Catey, was inaugurated on November 2006 and it is just 45 minutes from Las Terrenas (15 with the new highway in construction). You can reach here on chartered flights from the principal cities of North America and Europe. The International airport of Santo Domingo (Las Americas) receives all kinds of commercial flights from the majos cities in the western hemisphere. From Santo Domingo you can either take a commercial or private flight (30 minutes) with the local aeronautic companies (Aerodomca or Take Off) from either the airport La Isabela or right from the Las Americas airport. Another possibility is the taxi which takes around one and a half hours to get to Las Terrenas. The International airport of Puerto Plata is just 3 and a half hours from Las Terrenas and a lot of chartered flights from Europe, USA and the caribbean land here. From El Catey (Samana): 40 minutes by taxi. From Santo Domingo: 30 minutes by flight with Aerodomca or Take Off or by private flights which can take upto 7 passengers. By taxi or Bus count upto one and a half hours. From Puerto Plata: 3 and a half hours to Las Terrenas by taxi or Bus. There are no complusory vaccinations for the Dominican Republic. Visa: There is no tourist visa. On arrival you can buy a tourist card valid upto 3 months for 10 US$ (payable only in US$). And a tax of US$ 20 also payable ony in US$ has to be paid on departure. French, English, Germanc and Italian are spoken in the majority of the Hotels an Restaurants in Las Terrenas. The Euro is gradually gainig acceptance but its use is not yet thorough. All the major Dominican Banks have offices in Las Terrenas; Banco Popular, Banco Reserva, Banco del Progreso, ScotiaBank (Canadian). You will be able to carry out all normal transactions. You also have smaller exchange offices where it is sometimes to easier to change money. All the major credit cards are accepted in Las Terrenas. Quite a few ATMs can be found Las Terrenas. You can only withdraw money in Local Peso at the ATMs. 6 hours behind Francia in Summer, 5 in winter. The Codetel call center in La Terrnas allows you to call anywhere in the world. It is always easier and cheaper there. You can also rent mobile phones at the ORANGE shop. Mobile phones brought fronm Europe are less reliable and will cost you much more. Internet: Quite a few Cyber cafes are around in Las Terrenas to send and consult mail. You cannot always drink the tap water. It is pretty easy to find mineral water in all the shops. Various health services, pharmacies and doctors of different nationalities are available in Las Terrenas. The peninsula benefits from a temperate tropical climate thanks to the cool breezes of the Atlantic. The temperature varies from 25 to 30 degrees C on average and from 18 to 22 degrees C in the evenings, on the whole being very pleasant. The water temperature oscillates from 25 to 28 degrees C. Short tropical rains are common. December and May have the reputation of being the best months as everywhere in the caribbean. So some summer clothes and a small raincoat, maybe a swater for the evenings or the airconditioned restaurants, swimming trunks and maybe a pair of shoes if you plan to hike. Jeeps, cars, ATVs, motorbikes, scooters and bicycles can be rented in Las Terrenas. Taxis: Useful and interesting for moving around when in groups and travelling long distances. Comfortable and secure. reservation is possible by phone (ask and keep the telephone numbers of taxis you have used and liked). Guaguas: pick up/ taxi. Practical and cheap to move around when in groups and for average distances. Not too comfortable and safety is not the main concern but well and truly a unique experience. Conchos: Small mtorcycle taxis. Theses are almost a national symbol. Practical, they are everywhere and they are always on the lookout for potential customers. For short distances and for 2 people, (sometimes more); But the price (negotiable) for 2 is double…so it may be better to take 2. Safety questionable (no helmets, insurance ?) but the riders are skillful and careful. Bicycle rentals: The bicycle is slowly catching on in Las Terrenas. Local conditions do not make it a very favourable way of moving around. Motorbike rentals: The mtorbike is the best way to get around town and to discover the peninsula : climate, road width and state, scenery etc. You can rent all knds of bikes: from Dt to heavy bikes to mopeds. The moped is good enough for beginers. ATV rental: The ATV is another way to travel especially when you hit the dirt tracks. It is easy to use. At the same time one should not forget that it is a nuisance as it is loud and not the best way to circulate in the town traffic. 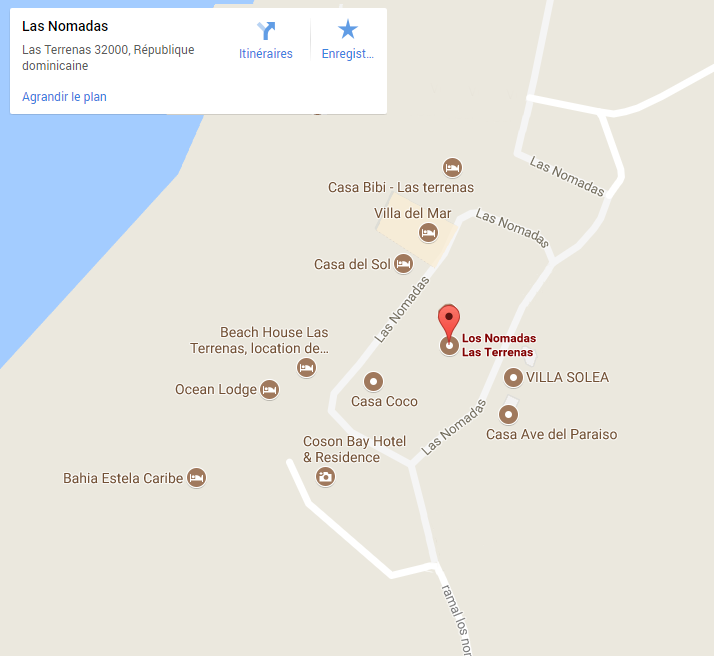 Car rentals: Lots of different agencies around where you can rent 4WD or tourism cars in Las Terrenas. It is better to reserve in advance, especialy the jeeps and in high season.